This is our favourite dish to make at home in the whole wide world. Cheap, easy, one pot, takes only 5 minutes and nutritious. There are so many variations to this soup. The key here is that it is a soup of which you can throw in ANYTHING. So what will you need? Vegetables: Make this soup to get rid of vegetables that are getting a bit old in the fridge. You can pack it with as many vegetables as you can, or as little as you have on hand. Vegetables such as: Mushrooms-Bok choy-Spring Onion-Cabbage-Broccoli-Carrot-Capsicum-Mushroom-Bean Sprouts-Zuccini…just to name a few. Noodles: are a great form of energy. We have so many to choose from now including: Wholemeal – Buckwheat-Soba-Udon-Singapore-Egg-Rice-Vermicelli. Always read the packet and choose noodles low in fat. Noodles less with less than 2grams of fat per 100 grams are a healthy option. Always read the label of noodles, as many noodles are deep fried before being packaged and can have up to 20 grams of fat per serve. 1 can Shitake mushrooms (or 2 cups of dried shitake mushrooms available from the Asian section of all supermarkets, soaked in boiling water for 1 hour). 100 grams of meat per person (optional). Our favourite is chicken thigh, but you could also use chicken breast, duck, sliced beef or pork. In a pot, cook noodles in boiling water to manufacturers instructions. Drain, rinse with cold water and set aside. Using the same pot, bring the stock to the boil. If using meat, add the chopped meat and cook through. Cooking time will vary according to thickness of meat. If you are cooking chicken thigh in 1 cm cubes, this should take only 2 minutes. Add any hard vegetables which will take the longest, such as carrot first. A minute later add all other vegetables. The vegetables should only take 1 or 2 minutes to cook through. When vegetables are done (make sure they are still lovely and crispy), place a handful of noodles in the bottom of a serving bowl. 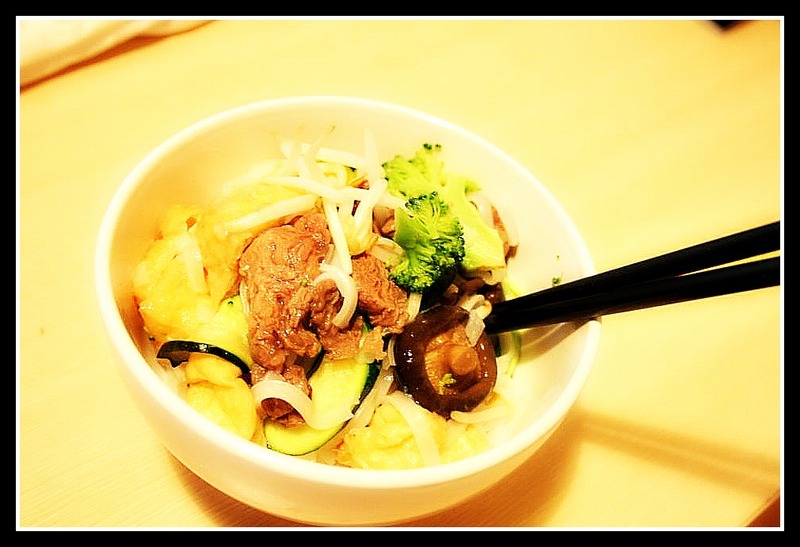 Ladle the soup, vegetables and noodles over the noodles. Top with thinly sliced shallot. 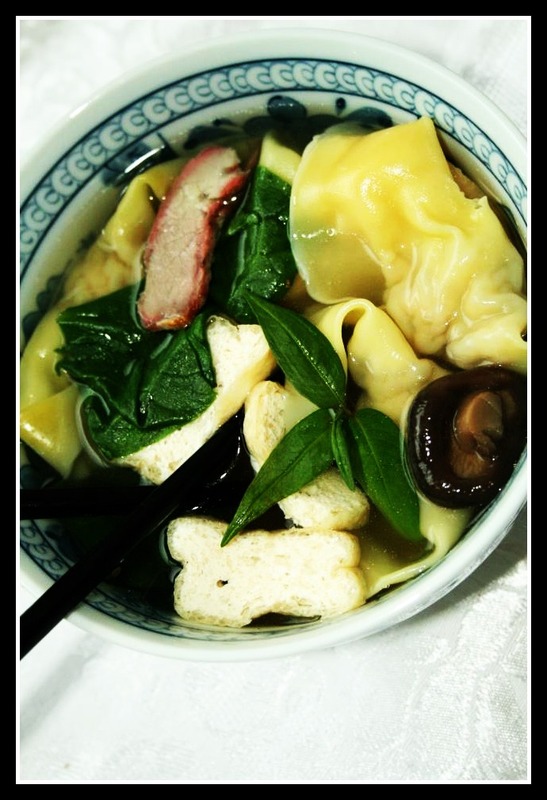 Other additions you might like to try: Cubes of tofu, top with Vietnamese mint or coriander, add won tons. Be adventurous and try lots of different combinations. Char siu pork, pork won tons, shitake mushroom, tofu and spinach soup. Stay happy and healthy…The Nutrition Guru and The Chef. Thanks Lindsay! To be honest, we buy it from chinatown. We have sometimes used a jar sauce from the supermarket, and simply marinate a pork fillet in this sauce then bake on a slow heat. Have you seen the jar sauces?